Authentic Thai coffee is called Oliang. The easiest way to make Thai Coffee is to use Oliang Power Mix. The Oliang powder looks like regular coffee grounds, just not as finely ground. The mix contains Coffee, Corn, and Soya Bean. This can be found in most Asian Markets, or use the links below. 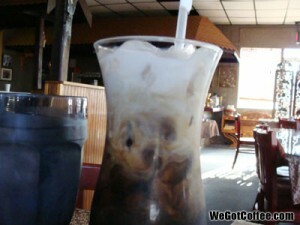 Thai Coffee is served over ICE! This is for Thai Tea, but can be used for Thai Coffee.